Morse, William Inglis. Gravestones of Acadie, and other essays on local history, genealogy and parish records of Annapolis County, Nova Scotia with photographs by the Author. Limited edition: #23 of 500. London: Printed by A. Smith &Co., 1929. 8 prelim. leaves unnumbered, 110 pages, 1 l., leaves of plates, portraits, facsimiles; 28.5 cm. Published in a numbered limited edition of 500; printed on handmade paper by A. Smith & Co. of London, England. Text designed by W.B. Dalton* and W.H. Amery**, with the assistance of the Artistic Typography Class of the Camberwell School of Arts and Crafts, London. 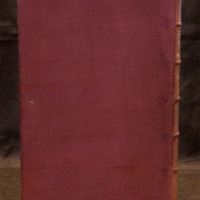 Main print run bound by the binding firm of Sangorski and Sutcliffe of London in quarter brown morocco leather with brownish red cloth covers and spine with five raised bands, gilt titling and gilt date and name of author are on the spine. Gilt titling, date and author are on the spine. An unknown number of the 500 copies printed were bound in commissioned full leather fine bindings by Douglas Cockerell and encased in slipcases of wooden boards covered with Cockerell marbled paper and lined with white felt. Copies with Cockerell fine bindings are located at Acadia University, Dalhousie University, and Harvard University. 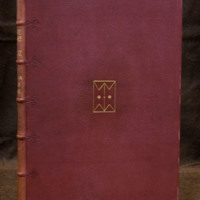 In full brown morocco leather binding, this volume’s front cover is decorated with a simple, central decorative motif composed of single gilt fillets forming the monogram “WIM.” The monogram is enclosed by a single gilt fillet border, with two flower tools evenly spaced on either side of the “I,” and a gilt dot evenly spaced in the middle of the “I.” The spine has five raised bands which form six compartments, and the title, in gilt and uppercase lettering, is stamped in the second compartment from the top. The author’s name in gilt occupies the third compartment, and the date of publication in gilded Roman numerals is located at the foot of the bottommost compartment. The spine's five raised bands are outlined with blind fillets that extend out to a point one centimeter onto the front and back covers. The point formed is highlighted by three evenly spaced blind stamped leaves. The top edge of the text is trimmed and gilded, while the other two edges of text are untrimmed. 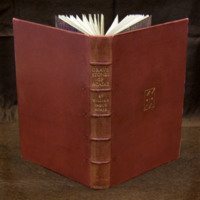 The leather turn-ins of the front and back inside covers are decorated with blind fillets. A series of gilt dots, evenly spaced one centimeter apart, are set along the inner side of the outer blind fillet of the turn-ins. “D.C. & SON 1930” is blind stamped in the lower left corner of the back cover turn-in, and the front and back endpapers display the distinctive Cockerell marbled paper pattern in shades of red, green, blue, and cream inks. The under-stated blind tooling that draws attention to the spine’s raised bands is very effective as a decorative feature. The sweeping flow of complementary colours in the marbled endpapers is very pleasing. *William Bower Dalton (1868-1965) was the talented British craft pottery designer and teacher who served as Principal of the Camberwell School of Arts and Crafts in London from 1899 to 1920 and as curator of the South London Art Gallery for over twenty years. He moved to Connecticut after his studio and home were destroyed during World War II. A personal friend of William Inglis Morse, Dalton was often consulted on creative aspects of Morse’s publishing ventures. (Biographical details in Victoria and Albert Online Journal, no. 4, summer, 2012).